Found on the edges of Frome and situated in the heart of this popular modern development and boasting a rare opportunity to buy a brand new shared ownership property. Campion Road is a great spot for access to transport links in and out of Frome, as well being only a pleasant jaunt into the town via Rodden Meadow. Frome town itself is one of Somerset's finest artisan towns which boasts a fantastic spirit of togetherness. There is a wide range of supermarkets, public houses, banks, theatres, schools, college and a sports centre as you would expect. However Frome prides itself on the great selection of independently run shops that line the historical cobbled streets, while away your days sipping coffee in one of the cafes or buying gifts from the amazing boutiques. Frome is well known for its weekly markets and its monthly artisan market on a Sunday which draws people from all around. There is a rail service that is on the Paddington Line and also feeds into the cities of Bath & Bristol. Transport links will have you quickly out onto the ring road and the cities of Bath, Bristol & Salisbury are well within reach. A tidy entrance into the property with space to kick off your shoes and hang your coats. Stairs to the first floor and doors opening to the cloakroom and lounge. A simple suite comprised of low level wc and wash hand basin with tiling to the splash backs. Tile effect flooring. A sizeable lounge which has been carpeted throughout, window overlooking the front of the property and handy under stairs storage cupboard. Door through to the kitchen / diner. A stunning room with a contemporary feel with wood effect flooring throughout and double doors opening out onto the rear garden. The kitchen is comprised of a range of wall and floor units with granite effect work surface over with inset one and a half bowl sink drainer and four ring gas hob with stainless steel splash back and matching cooker hood. Fitted electric oven and space for washing machine, dish washer and fridge freezer. Tiling to the splash backs and wall mounted combi gas boiler. White painted banister and spindles; access to all first floor rooms and access to the loft. Sat to the front of the property and enjoying two windows which let in plenty of light. Benefiting from a sizeable storage cupboard over the stair threshold which could be converted to a fitted wardrobe. Another sizeable double bedroom with plenty of space for a range of bedroom furniture and enjoying views over the rear garden. Very well presented bathroom suite with panelled bath with shower over and folding shower screen preventing the splashes hitting the floor. Low level wc and wash hand basin. Tile effect flooring and tiling to all splash backs. There are two side by side parking spaces to the front of the property with an area of garden which is laid to shrubs. Access to the side of the house via a wooden gate leads to the rear garden. External power point. The rear garden is of a reasonable size and comes with a patio to the rear of the house and timber built garden store is handy to keep your gardening bits in. We are told that the main garden will be turfed before occupation. Wood panelled fence surround. Buyers attention is drawn to this property being Shared Ownership and it is therefore classed as a leasehold. If the purchaser buys the whole of the share then it will revert back to freehold ownership. Initially based on a 40% percent share the rent is £288.95 pcm and the service charge (including buildings insurance) is £22.62; if the % share bought is increased the rent reduces. Potential buyers will need to meet certain criteria before a viewing can be arranged. Call us for further information. 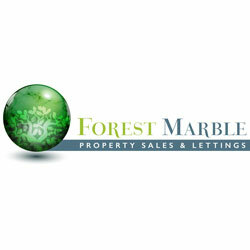 At Forest Marble estate agents we bring together all of the latest technology and techniques available to sell or let your home; by listening to your specific requirements we will work with you so that together we can achieve the best possible price for your property. By using our unique customer guarantee we will give you access to a true 24/7 service (one of our local team is available when you have time to talk), local knowledge, experience and connections that you will find will deliver the service you finally want from your estate agent. Years of local knowledge covering Bath, Frome, Westbury, Warminster, Trowbridge, Gillingham, Radstock, Midsomer Norton and all surrounding villages. We offer a full range of services including Sales, Lettings, Auctions, Independent Financial Advice and conveyancing. In fact everything you need to help you move.